The end of summer is nearing and fall is just around the corner. It’s time to begin ushering in those pumpkin spiced drinks, harvest decorations and festive harvest themed parties and outings to see the vibrant colors of leaves as they fall from the trees or to spend time with friends sitting around a bonfire in the evening. With the upcoming weather changes and fall scenes however, it doesn’t exactly mean that the temperatures will drop so drastically that you’ll be able to shut the air off and stop cooling your home to stay comfortable. While many parts of the country will be able to happily keep those nice summer temperatures all year long, others will soon see the weather changing and cooler temps set in. This means that quite a few people will start slowing down on keeping their AC cranked up and will begin turning to sources of heat for the next few months. Although your AC time may be limited, you should still heed a few great tips to make sure your AC maintenance for the end of the summer is taken care of. When it’s time to start turning the air down, but not yet cool enough to start using your heat, be sure to utilize those ceiling fans you have throughout the house. They will help keep things cool while helping keep your power bills down. Did you know that using a ceiling fan Can also help keep allergens at bay by keeping the air circulating in your home? Be sure to use your fans to keep air flowing and to give your AC unit a little rest before cold weather hits. Filters should be changed at the end of summer to ensure the air stays clean as it circulates throughout the home. A clean filter is a preventative step to keeping allergens out and keeping those seasonal allergies under control all winter long. Your AC unit works hard all summer long, and in that time, your air ducts have most likely built up a little dust or grime. Remove the covers and give the ducts a good cleaning before moving into the colder weather and heating the home. Check the unit outside the home to make sure it hasn’t gotten dirty. Be sure to check for broken limbs or leaves that may have flown into the unit during storms or other bad weather and remove them promptly. This is, of course, something that you need to do year-round to keep your unit running smoothly. Your AC unit should be inspected just before spring and just before the fall every year to ensure it is running smoothly. 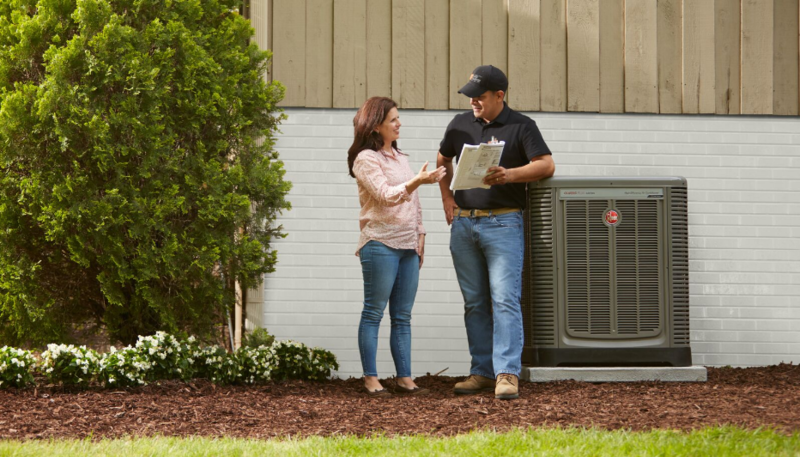 When you call to have a professional AC contractor come out to inspect the unit, they will check the system to make sure it has the proper level of refrigerant in the spring but will check to make sure it’s ready to switch over to heat in the fall or winter. Be sure to schedule maintenance before you find yourself without any air on a hot fall day or without access to heat when the temperature drops and you need to stay warm and cozy. Time for an AC Inspection? It’s that time of year again and when you’re ready to have a pro come out to inspect your AC unit, be sure to contact Contractors Today for a great AC pro referral!